How's that for an odd post. An odd topic if you are unfamiliar with those who have played for the Kelowna Rockets over the years. 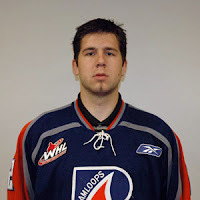 Players like Josh Lepp, Richie Regehr, David Schulz and J.J Hunter all have one thing in common. All four are Christian athletes. All four are proud of it. When you are a junior age player between the ages of 16 and 20 it's tough to stand up for what you believe in. It's so much easier to keep quiet, go with the flow, and stay under the radar for the fear of fellow teammates think you are weird because you are 'religious'. Yet when I have approached each one with the question "Are you a Christian athlete? ", each one without hesitation said yes. Schulz is from Winkler, Manitoba which is essentially bible belt country. That said, because you were born and raised in that community does not guarantee that being a spiritually guided athlete is a given. Schulz doesn't hesitate when asked about his faith. "I grew up in a Mennonite community, and ya I take my faith seriously. I found when I played in Swift Current when I was 16, it really helped me strengthen my faith because Luke Hunter was there". Luke Hunter is the younger brother of former Kelowna Rockets fan favorite J.J Hunter who was never shy to talk about his faith in God. In fact the Hunter brothers are so passionate about their faith they join Mom and Dad back in Shaunavon, Saskatchewan each summer and travel around Western Canada singing gospel music together. "I find it hard at times to live a Christian lifestyle", Schulz admits, "but if I didn't have my faith in God I don't know where I'd be". Former Rockets goaltender Josh Lepp also grew up in a Christian home, and even at the tender age of 16 as a shy rookie, Lepp was not shy when talking about his faith with others. No he wouldn't shout it out from the mountain tops, but if asked, he would openly share what Christianity means to him. Being a Christian athlete goes far beyond the confines of the Kelowna Rockets dressing room. In Kamloops, the Blazers designated tough guy is a Christian. Matt Kassian, one of the best interviews in the W.H.L, won't hesitate when expressing the value he puts on his faith in God. "I will be the first to say that I make mistakes, and I'm not perfect by any means and I still have things I need to work on. The biggest thing is to make a stand early, and to set out who you are going to be. A lot of people don't think you are going to get respect because you are a Christian athlete, but that is totally false." Kassian's says his Father was instrumental in guiding him towards the faith he chooses today. In fact his dad is the chaplain for the Canadian Football League's Edmonton Eskimos. Yet some will question Kassian on how he can be a Christian athlete on one hand, and play the role of pugilist on the other. "I don't feel bad about the role I play and the fact that I am a Christian. If my motive was to go out there with the desire to physical hurt someone, then that's a different story. I am out there trying to change a hockey game, not to injury anyone. Some will say being spiritual and playing my role don't mix, but I'm comfortable with it", Kassian added. While it's not clear how many Christian athletes are playing this season in the Western Hockey League, it is refreshing to see that in today's 'follow the leader' mentality where standing up for what you believe in isn't celebrated but shunned, the players mentioned in this article talk openly and passionately about there faith, as passionately as they do about playing the game of hockey. A 'Giant' Leap of Faith? Coach ! What were you thinking? Players you hate - but would love to have! Three Points for a Win Please! The Wack's Success has me Worried! Former Rockets Back in the Bigs! It wasn't pretty, but a wins a win!